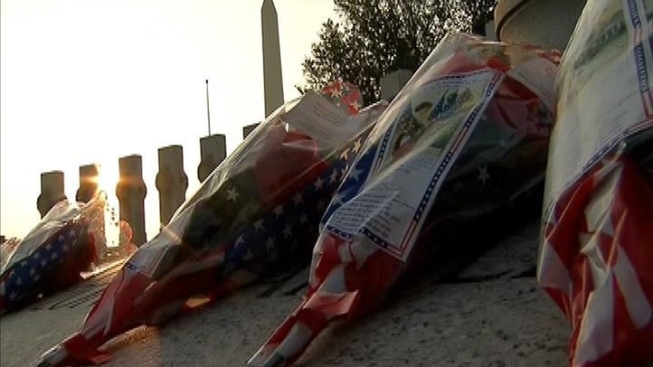 The National Memorial Day Parade kicks off Monday afternoon in downtown Washington, and other events take place throughout the day. Organizers for the parade are preparing for more than 250,000 spectators to line Constitution Avenue and the National Mall. Almost 200 elements will take part in the parade: marching bands, active and retired military units, parade floats and of course hundreds of veterans from World Ward II to the current conflicts in Iraq and Afghanistan. The parade is set to include a special tribute this year to the victims of the Sept. 11 terrorist attacks and to the first responders, the Associated Press reported. Special guests at this year's parade include actors Joe Mantegna and Gary Sinise, as well as Wheel of Fortune Host Pat Sajak. Korean War Veteran and moon-walker Buzz Aldrin will be there, as will members of the Tuskegee Airmen, the legendary unit of African-American pilots from World Ward II. The guests of honor include Thomas Hudner, a Navy captain who won the Medal of Honor for his actions in the Korean War, and Roger Donlon, a retired Army officer who served in Vietnam and also received the Medal of Honor. Locally, D.C. Mayor Vincent Gray will serve as an honorary grand marshal of the parade and some of the Pearl Harbor survivors from the D.C.-area will also be on hand. The parade officially begins at 2 p.m. at the corner of Constitution Avenue and 7th Street NW. It will proceed west down Constitution, past the White House, ending at 17th Street. It is expected to run until 5 p.m.
Other Memorial Day events include a wreath-laying at the World War II Memorial at 9 a.m., and a breakfast hosted by President Barack Obama and first lady Michelle Obama at the White House for Gold Star Families, which are families who have lost a loved one in combat. After, the president heads to Arlington Cemetery to lay a wreath at the Tomb of the Unknowns. The 11 a.m. wreath-laying caps about a two-hour observance. A U.S. Marine Band concert will be held at the Memorial Amphitheater. The Tomb of the Unknowns is also serving as the site of a “national moment of silence” ceremony at 2:55 p.m. and a memorial service by the Sons of Union Veterans of the Civil War at 5 p.m., the Associated Press reported. In the afternoon, an observance takes place at the Vietnam Veterans Memorial at 1 p.m., with bagpiper Chris Jackson playing "Amazing Grace," and Tenley Westbrook will perform the National Anthem. The keynote speaker will be Juan Garcia III, assistant secretary of the Navy. Five names were added this month to the memorial's wall, and the relatives of those honored will attend the ceremony, the Associated Press reported. The additions include Army Spec. Charles Sabatier, of Galveston, Texas. He was wounded in 1968 in the Tet Offensive when a bullet pierced his spinal column and left him paralyzed. He died in 2009 as a result of his condition. The additions bring the number of names on the wall to 58,272. Folks looking for an alternative to Memorial Day festivities in D.C. can look to Falls Church, Va., which is hosting its 30th annual parade -- sort of. The Falls Church parade -- one of the larger events in the region -- actually began in 1951. But in 1981, the city canceled the parade because of a gasoline crisis, the Associated Press reported. The parade resumed in 1982 and has been held every year since. It kicks off at 2 p.m. with a reviewing stand across from the city's community center, according to the AP. A 3K fun run will be held in the morning and a veterans' ceremony will be held at 11 a.m.